The primary purpose of walk greens mowers with independent cutting units is to follow contours. It is in this area the 180 E-Cut™ and 220 E-Cut Hybrid Walk Greens Mowers truly excel. It all starts with the ball-joint mounting system that attaches the cutting unit to the traction drive system. 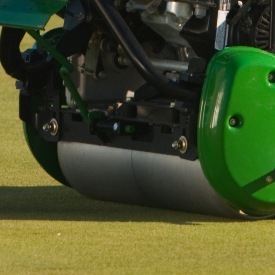 Similar to the PrecisionCut™, E-Cut hybrid riding greens mowers, and fairway mowers with Quick-Adjust 5 (QA5) cutting units, the ball-mounting system allows the cutting unit to rotate in any direction. The cutting unit not only moves fore and aft, and laterally side-to-side, it also steers in turns, which translates to a much more turf-friendly premium cut in cleanup passes around the perimeter of the green. Due to the ball-joint design, and also the fact that the wiring harness is the only connection to the reel drive system, the cutting unit has virtually no mechanical linkage to restrict movement of the cutting unit in the toughest of undulations. It is basically a one-gang triplex, and many are familiar with how well the PrecisionCut and E-Cut hybrid riding greens mowers follow contours, especially in the cleanup passes. For maintenance, the reel can be removed by simply removing a pin, and the electric motor itself features a quick-attach design by simply loosening two 15-mm bolts, turning the motor slightly, and pulling the motor off of the cutting unit. 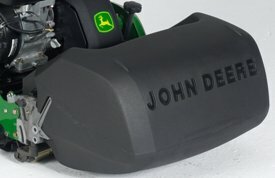 Limit chains on each side of the cutting unit control how much the cutting unit contours while mowing, while also controlling the amount of rear-roller drop when the unit is lifted for turns. 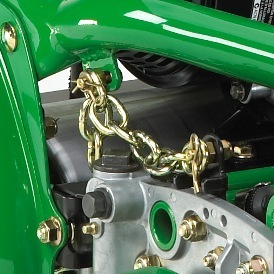 The initial setting of the chain is exactly the same as the 2500B PrecisionCut and 2500E E-Cut Hybrid Riding Greens Mowers. Two links should hang free, which means the chain itself is shortened to seven links. The upper chain anchor studs should be centered in their slots. This setting provides maximum contour following and maximum rear-roller drop when lifted. However, the majority of greens will not require maximum contour following. Turning and maneuvering are easiest when the amount of contour following is limited to the requirements of the surface being mowed. To limit the contour following of the cutting units, adjust the upper chain anchor studs backward in the slots to limit float and reduce the rear-roller drop. If further limitation is desired, shorten the chain to six links (three hanging free), and move the upper chain anchor studs forward in their slots. The benefits of hybrid technology are numerous. The 2500E E-Cut™ Hybrid Riding Greens Mowers and E-Cut Hybrid fairway mowers are proof of that. So why not move that same technology to the walk-behind greens mowers? With the 180 E-Cut and 220 E-Cut Hybrid Walk Greens Mowers, hybrid technology is now at your disposal on even the most undulating of greens. In the case of walk greens mowers, hybrid technology provides more benefits than just noise reduction, fuel savings, and the elimination of any hydraulic leak points. With the 180 E-Cut and 220 E-Cut Hybrid Walk Greens Mower platform, the hybrid technology also allows a truly independent cutting unit that quickly reacts to contours, not only allowing the cutting unit to pivot laterally and fore-aft, but also to turn side to side for mowing cleanup passes. 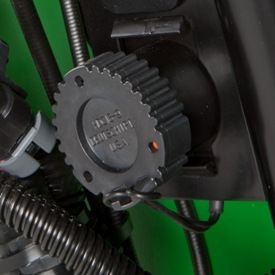 Because of the hybrid technology in the 180 E-Cut and 220 E-Cut Hybrid, the only link between the cutting unit and the traction unit for turning the reels off and on is the wiring harness. The wiring harness can easily move in any direction the cutting unit needs to go. 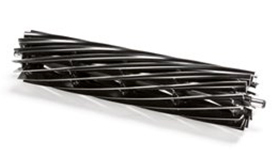 There are no hard linkages in the reel-drive system to limit the cutting unit's ability to follow contours. In addition, the electric drive system makes it easy to backlap by simply flipping a switch. No need for a special backlapping tool to spin the reel in reverse. It is all on board the 180 E-Cut and 220 E-Cut Hybrid as base equipment. Frequency of clip is also adjustable by a dial behind the handlebar cover. The system is powered by a Honda® engine, which turns an electric motor that is used as a generator. In between this motor and the electric reel-drive motor is the reel controller itself. 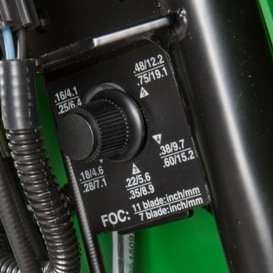 Similar to the controllers used on the 2500E E-Cut Hybrid Greens Mowers and E-Cut Hybrid fairway mowers, the controller takes the power from the generator and controls the reel speed. This particular controller monitors engine rpm and controls reel speed to precisely match the frequency of clip that has been set. 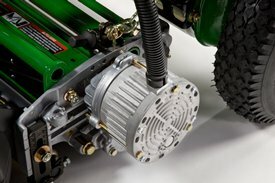 The electric reel-drive motor itself is the same one used on the 2500E E-Cut Hybrid Riding Greens Mowers and E-Cut fairway mowers – proven technology with proven results. The buzz in the industry is all about frequency of clip. But what exactly is it? Frequency of clip is defined as the distance traveled between consecutive cuts. In other words, it is how far the machine moves from the time one blade passes across the bedknife until the next blade passes. The lower the frequency of clip, the less distance that is traveled until the next blade passes. There is a point of diminishing returns when it comes to frequency of clip. The less distance the mower travels between consecutive cuts, the more times the same grass blade is going to be impacted by the reel, which leads to bruising of the turf – especially in the overlap from pass to pass. So, what is the optimum frequency of clip? It all depends on conditions. And the 180 E-Cut™ and 220 E-Cut Hybrid Walk Greens Mowers give the ability to establish a frequency of clip that is appropriate for individual conditions. The adjustment is a rotary dial located behind the handlebars. The system comes with a standard locking cover that must be accessed with tools, ensuring only those trusted to make this change, such as the superintendent or technician, can do so. Once the frequency of clip is established, the 180 E-Cut and 220 E-Cut Hybrid Walk Greens Mowers mow at that frequency of clip, no matter the traction speed of the machine. It does this by monitoring the engine rpm. As the throttle is decreased, the controller slows down the reel motor to match the new speed of the traction system, maintaining a constant frequency of clip. As the throttle is increased, the controller speeds up the reel motor to maintain the frequency of clip. Similar to the SL Series Walk Greens Mowers, this system keeps frequency of clip the same from operator to operator. This means no cut quality difference between more experienced operators mowing at a faster ground speed and less experienced operators mowing at a slower ground speed. A significant benefit to the electric reel-drive system is that it is very simple to change the direction of the motor, which allows the cutting unit to spin either forward for mowing or backward for backlapping. The 180 E-Cut™ and 220 E-Cut Hybrid Walk Greens Mowers can be backlapped without needing any external devices to drive the reel backward. It can do it all by itself with a simple toggle switch located on the rear left-hand side of the machine. 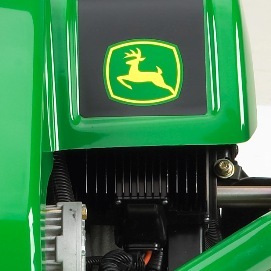 To backlap, simply set the park brake, start the engine, toggle the mow or backlap switch to backlap, and turn on the power take-off (PTO) by toggling the PTO rocker switch on the front of the handlebar cover. The reel controller automatically sets the optimum backlapping speed; no special tools or rotary dials are needed to adjust the speed. This onboard backlapping saves a lot of time and money, while keeping reels in top shape for a premium quality of cut. For quick and easy troubleshooting should an issue arise, a diagnostic light is located on top of the handlebar cover. If the electrical system sees a problem, a diagnostic code flashes through the indicator light. 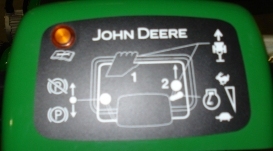 The code is repeated until the power take-off (PTO) switch is cycled off and on again, or the engine is shut off and turned on again. When a code is discovered, consult the technical manual for additional troubleshooting information. If a continuing condition exists, the diagnostic code displays again when the engine is started, until the original condition is corrected. The controller is also configured to store any code that has been displayed, so dealers can see a detailed history of the unit to aid in additional troubleshooting. The information is accessible by dealer technicians only using Service ADVISOR. 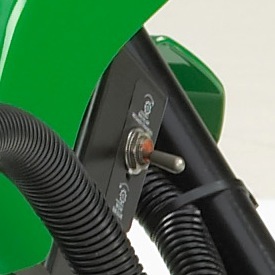 The direct-mounting grass catcher is designed to retain clippings by slowing down the air volume and routing it out of the catcher while keeping the clippings in. Molded-in grooves and mounting brackets make it easy to remove and replace the catcher. The catcher is made of lightweight polyethylene material that resists corrosion and cracking, reduces vibration, and is easy to use. Overlap marks for lining up to previous pass are molded into the top of the catcher for increased productivity and straightly mowed passes. 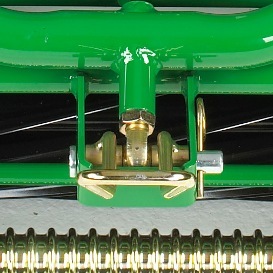 The direct-mounting design grass-catcher system is fixed to the same plane as the reel. This means the grass catcher follows contours exactly as the reel does, maximizing the volume of grass thrown into the catcher. It also increases operator productivity by the easy removal and installation of the grass catcher. The traction-drive rolls are constructed of aluminum, which offers corrosion resistance for durability and a long life. The smooth roller surface on the 180 E-Cut™ and 220 E-Cut Hybrid Walk Greens Mowers provide an evenly-rolled appearance on greens and other mowing surfaces.